After the success of its first corner at The Mini Superbrands in Harrods, London, this season Mischka Aoki is expanding its reach further by opening two more Amazing New Corners in Dubai, UAE and Doha, QATAR, with more exciting things in the plan to be unveiled soon. “We have a diverse and fascinating projects in the pipeline, and these store corners is just one of a preliminary steps of what’s to come... ” –Winnie, President & Founder of Mischka Aoki. Mischka Aoki Fall Winter 2017 Collection tells a story to discover and live. A delicate wind blowing us back to 1620, the candles restart to light, the dust is swept away, From the paintings on the walls of the palatial palace, ethereal girls animate and revive giving life to the great and cold rooms, now abandoned, on the gentle and impalpable notes of Renaissance music. 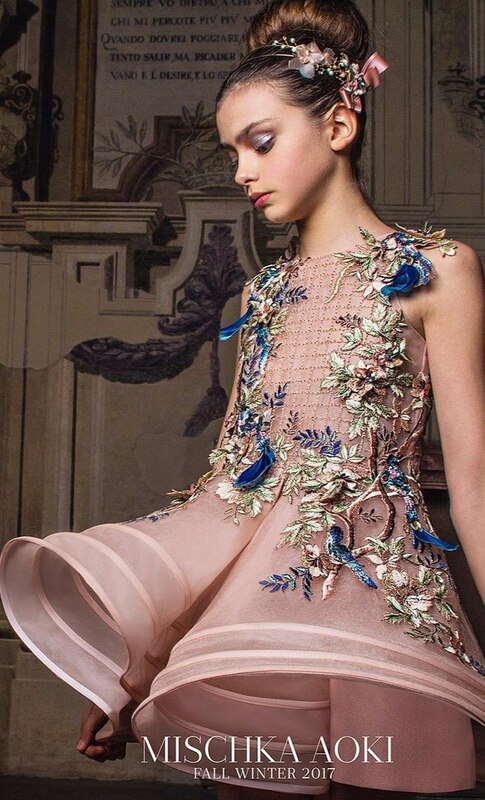 The young girls, who in time have preserved their altering beauty, wear sumptuous and luxurious Mischka Aoki’s dresses, leader in haute couture dedicated to childrenswear. Precious Italian craftsman’s silks are used to create skirts that recreate geometric games and volumes. The classic shapes are broken by contemporary lines, the result of a continuous stylistic research. 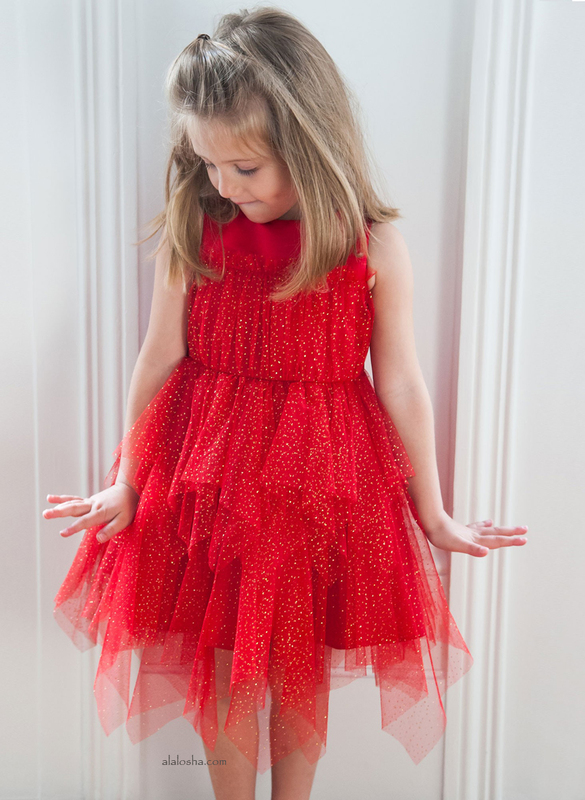 Luxurious French lace recreates an elegant game of transparency. Feathers become a meticulous detail. 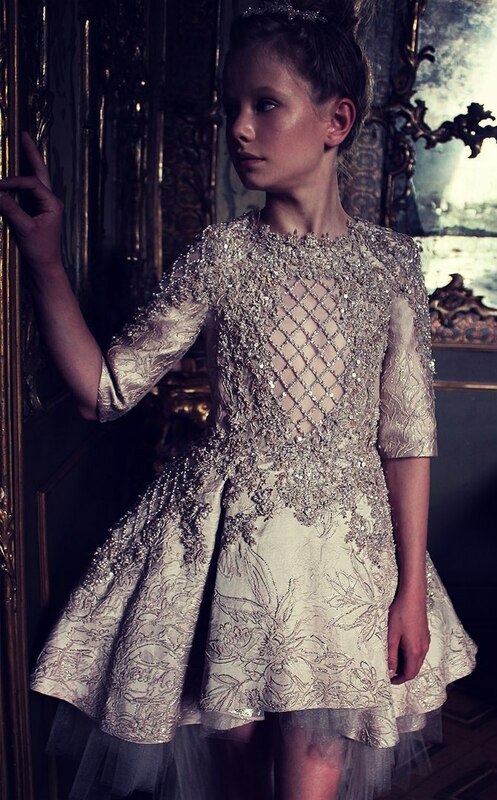 Jacquard, brocade, pleated tulle and embroidery and the best existing fabrics dominate the exclusive collection. The floral embroideries, strictly hand-sewn, alternate with majestic peacocks on top and skirts that recall the painting inside the palace, images that tell stories of travels in exotic and mysterious lands. The color palette of this season is enriched with soft colors; Golden brown tones, light pink pastel, sugar paper, white and yellow and fuchsia brush strokes. 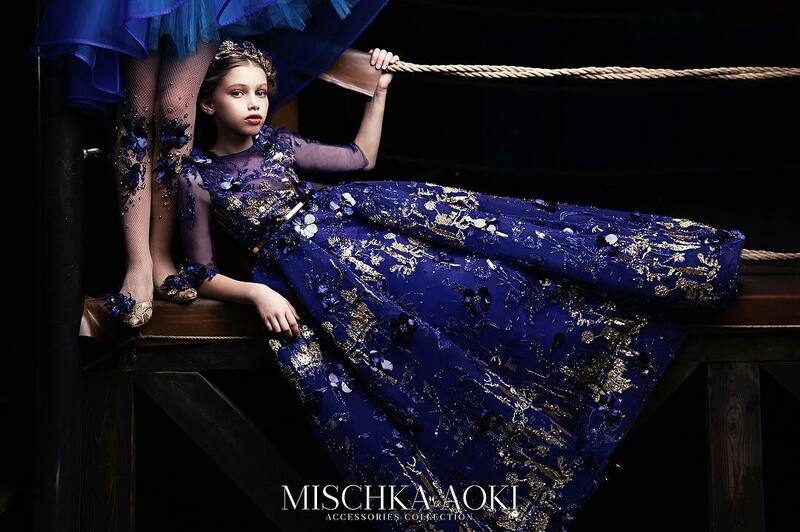 Mischka Aoki offers its customers only the finest creation, from industry leaders to Royal Families worldwide and frequently seen on the Hollywood Red Carpet and worn by Hollywood’s mini fashion celebrities.